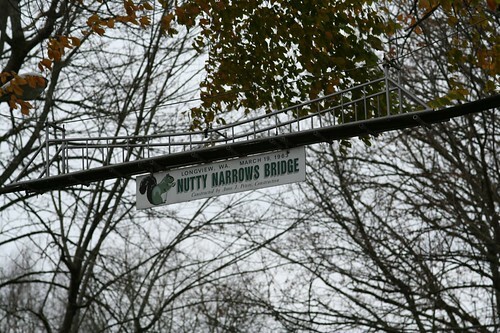 World's narrowest bridge is "Nutty Narrows Bridge" at near Olympia Way-Washington Way junction, Longview, Washington, USA. It is in fact meant for squirrels and is World's Narrowest Animal Crossing. The Bridge - a brain child of a local builder, the late Amos Peters was built in 1963 to provide passage to squirrels across the busy thoroughfare. Peters was not happy with the high causality rate of squirrels who used to cross the road in search of food so he came up with the idea of a small bridge. With the consent of civic authorities, he and his friends built the 60-foot bridge from aluminium and lengths of fire hose - It cost $1,000. The bridge decayed in about 20 years and was taken down by Peters, who after repairing and repainting of the sign re-installed it in July 1983. By now the fame of the bridge had travelled far and wide - Chip‘n’Dale and Mickey Mouse from Disneyland, about 300 children and local dignitaries were present at its re-dedication. The original bridge was on Olympia Way - Washington Way junction In 2007 the bridge was relocated near the Longview Public Library over Olympia Way as the original trees supporting the bridge had to be removed as they had developed disease. In 2010 it was moved again to its current location over Olympia Way. As per this report another squirrel bridge is being planned in Scotland. However I am not aware whether it has been built or it is still on the drawing board. 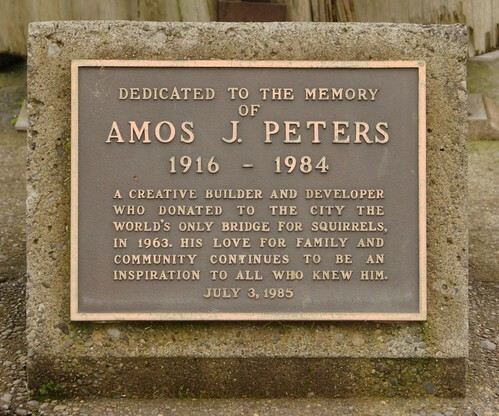 Peters died in 1984, and a ten-foot wooden squirrel sculpture was placed near the bridge in his memory. In the 1960s a family holiday highlight for me and my 3 siblings was to see the tree lights at the nearby RA Long city center park. 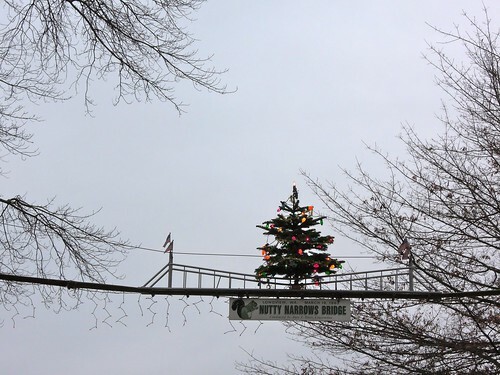 The trip was never complete without stopping to see the also-decorated Nutty Narrows. It has always been an iconic image of my childhood in Longview, WA. My favorite view was the one time I saw it covered in snow, with the Xmas lights. Priceless.